Located close to the centre, offering views of Renécros Bay. Located near the centre, in the heart of the Provencal wine-making region. 300 metres from Renecros Beach. 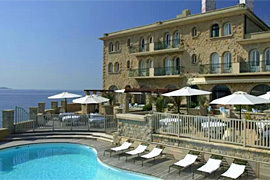 Charming 18th century hotel situated in an extremely pleasant location. The Key Largo overlooks the sea, just opposite the island of Bendor.